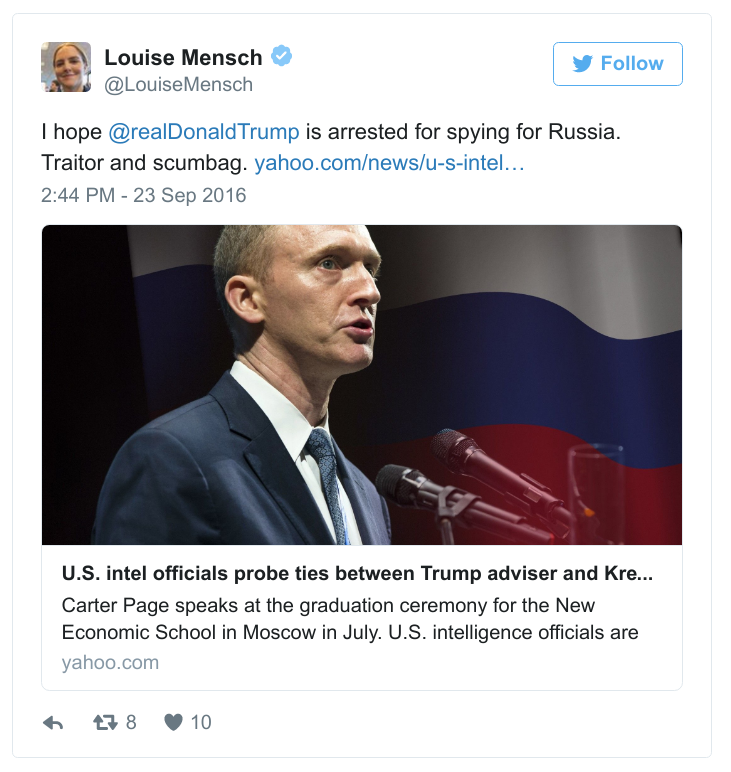 Since Donald Trump burst onto the scene, one of his most tenacious critics has been Louise Mensch, a former member of the British Parliament. (She represented the Conservative Party, oddly enough.) Mensch has somehow managed to become queen of the never-Trump conspiracy theorists who believe that Russian President Vladimir Putin is greatest political puppet-master in history. But what if it’s all just an act on Mensch’s part? 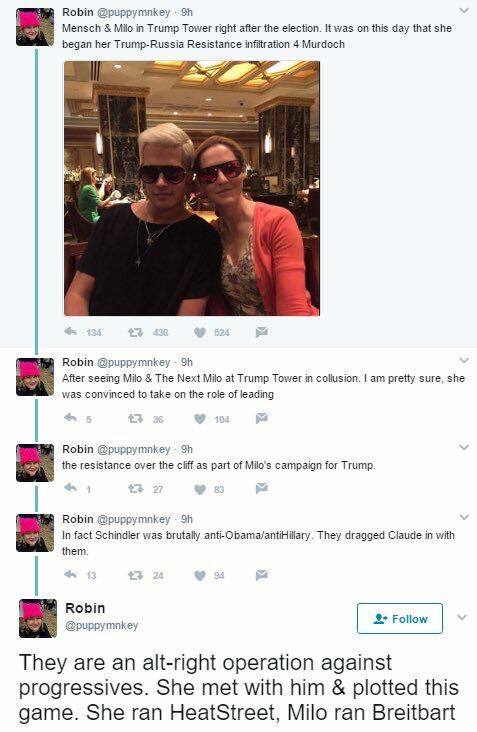 In a Thursday Facebook post, former Breitbart columnist and pseudo-alt-right bad boy Milo Yiannopoulos (who remains a Trump supporter) decided to turn the tables on Mensch. He endorsed a conspiracy theory proposed by a liberal Twitter user to the effect that Mensch’s proliferating conspiracy nonsense was actually an attempt to make left-wingers look gullible and stupid. Before getting to Yiannopoulos’ allegation, let’s discuss Mensch a bit more. Prior to becoming the queen of Putin obsessives, she was the editor of Heat Street, a young-skewing conservative website owned by Rupert Murdoch that was seemingly created as a reward for Mensch after she refused to condemn Murdoch's company, News Corp., at the conclusion of a parliamentary investigation into its infamous phone-hacking scandal. But things didn’t quite work out for Mensch at Heat Street. Its stated goal to attract young right-wingers effectively made it into a hub for the alt-right, which many younger conservatives view as their only political home, given how utterly the Baby Boom generation dominates the Republican Party. That created an issue for Mensch, given how thoroughly she had opposed and rejected Trump's candidacy during last year’s GOP primaries. After she was exposed as having tried to write television ads for Democratic nominee Hillary Clinton, Mensch and Heat Street parted ways. Since striking out on her own, Mensch has doubled down on conspiracy theories about Vladimir Putin's ability to orchestrate seemingly random and unrelated world events. In February of this year, she claimed that the Russian oligarch had assassinated conservative media entrepreneur Andrew Breitbart, to give but one example. As part of her conspiratorial connecting the dots, Mensch has decided that fellow British expat Yiannopoulos is also part of the Putin grand axis of evil. In anticipation of a story Mensch published about Yiannopoulos on Thursday, the former Breitbart columnist decided to create a conspiracy theory about Mensch by endorsing the speculations of a left-wing Twitter user that Mensch was actually trying to make liberals look bad by cooking up her ridiculous theories about Putin. After quoting the tweets cited above, Yiannopoulos essentially endorsed them. "It is the Waldorf Astoria not Trump Tower but otherwise correct — she promised to take the Trump opposition so violently off into conspiracy theory and lunacy he’d be guaranteed a second term. Safe to say she has delivered!” he wrote. It’s a nonsensical charge, given that Mensch has been on a Trump-Putin tear long before the former reality television star won the presidency. She literally called for Trump to be arrested last September. If only we could get Donald Trump as enthused about keeping British attention-seekers out of American politics the way that he wants to keep out others. When England sends its people, they’re not sending their best.